The SAP Business Information Warehouse enables you to analyze data from operational R/3 applications or any other business application. You can also extract and analyze data from external sources such as databases, online services and the Internet.The SAP Business Information Warehouse supports Online Analytical Processing (OLAP) and, thanks to its structure, is particularly suitable for processing large volumes of operational and historical data.The system, which is preconfigured by Business Content for core areas and processes, allows you to examine the relationships in every area within your company. 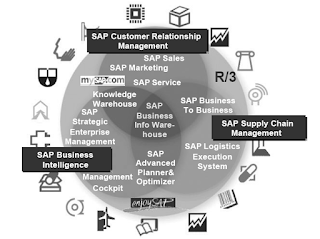 The SAP Business Information Warehouse has a central position among the mySAP solutions. Typical characteristics of the individual solutions are separate development, implementation, and maintenance of the components, and independent release cycles in the different areas.BAPI and ALE technology takes care of communication between these various systems. n The advantages of this architecture include quicker implementation, flexibility, openness, and extendability. 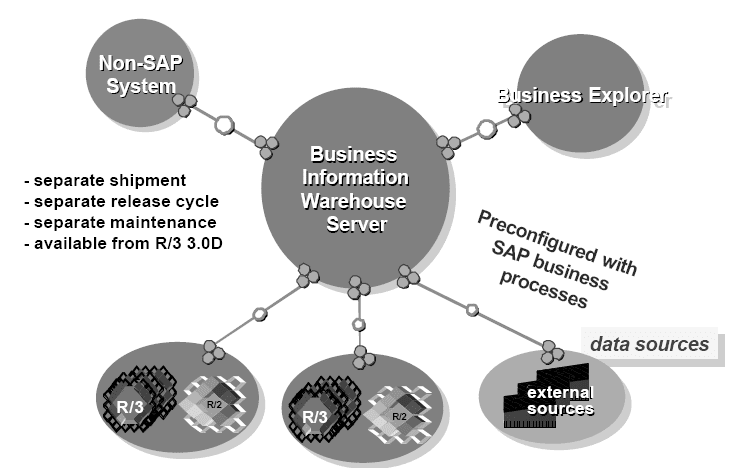 The SAP Business Information Warehouse is one of the first examples of the new functionalities provided by the SAP Systems as part of the Business Framework concept.This concept is characterized by autonomous development, implementation, and maintenance activities, as well as separate release cycles.Releases up to and including 3.0D are regarded as non-SAP systems by the Business Information Warehouse. For SAP Systems from Release 3.0D, SAP delivers extractors with Business Content. 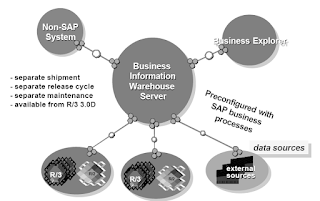 These extractors enable the data flow from the SAP Systems into the Business Information Warehouse and make available the business functionalities that are preconfigured in Business Content.The SAP Business Information Warehouse requires an SAP System of Release 4.0 or higher. BAPI interfaces support the extraction of data from non-SAP systems as well as data analysis with external methods. You can think of the SAP R/3 Systems and external systems as data sources. Administration for Metadata and other application data is carried out on the Business Information Warehouse Server.The various source systems are managed using the Administrator Workbench of the Business Information Warehouse. The Scheduler and Monitor components of the Administrator Workbench are used to plan and monitor the transfer of Metadata and transaction data from the assigned legacy systems.The third layer of the BW architecture consists of the Business Explorer and its reporting tools. Decision-makers urgently need reliable information from Production, Purchasing, Sales and Distribution, as well as from the Finance and Human Resources departments. They require an up-todate and comprehensive picture of each business area, as well as of the business as a whole. This situation places considerable demands on data staging from the underlying data sources.The information must be stored in a homogeneous and consistent form at a central point from where it can be called up. Modern data warehouses, therefore, require a separate database, upon which an independent application environment can objectively provide the required services. As far as the presentation is concerned, efficient analysis techniques with powerful multimedia visualizations are indispensable. The system must be able to cope with the information needs of the most varied of user groups.On the OLTP side, the demands are reduced to an economic and comprehensive preparation of the data required by the data warehouse. With these goals in mind, SAP has opted for a separate data warehouse solution that handles reporting activities as an autonomous business component, even providing a separate server with its own database and SAP System: The SAP Business Information Warehouse.The concept and architecture of the SAP Business Information Warehouse are designed to fulfill all of the expectations and objectives mentioned.Having implemented the Business Warehouse and its Metadata Repository, the customer has the clear advantage of being able to use the entire SAP know-how built up over the many years of experience gained in developing business softare solutions. 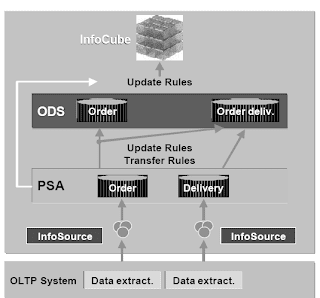 SAP R/3 Systems can be configured as OLTP systems, and make the entire SAP Business Content data available in the form of so-called Data Sources. The SAP Business Information Warehouse is shipped with all of the Metadata on the common business processes of the SAP OLTP System. These include InfoSources, InfoObjects, standard InfoCubes, and standard reports. These are accompanied by transfer structures for all of the supported releases, as well as communication structures and update rules for each InfoCube. This means you can automatically transfer data with a standard analysis immediately after installation and connection to the source system. The Business Information Warehouse usually requests the application data from the assigned source systems at regular intervals (pull mechanism). You can specify the intervals at which the data is transferred. For this reason, each application in an SAP R/3 OLTP System contains data-collecting instances (DataSources) that stage the application data for the Business Information Warehouse. In this way, the SAP Business Information Warehouse provides an integrated data warehouse solution in an SAP System landscape. Up to 70 percent of all OLAP System users are one-time users.Compared to the advanced users and query developers, they only use the system's analytical functions on a very small scale. This is because they usually carry out predefined queries with fixed datasets. 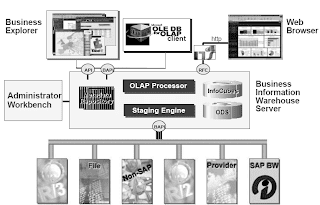 Most of our users therefore need a simple user interface.The experienced users and query developers, who design and carry out information analyses on several levels, must be able to use a comprehensive and effective range of tools for their analyzing options.SAP has catered for these various user needs in the development of the Business Information Warehouse.